From Africa’s richest man, Alhaji Aliko Dangote to wife of the Senate President, Mrs. Toyin Saraki to leading politicians and technocrats, Nigerian’s high society in their numbers stormed the 60th birthday ceremony of Hon. Olajumoke Abidemi Okoya, the three-time former Member, Federal House of Representatives. 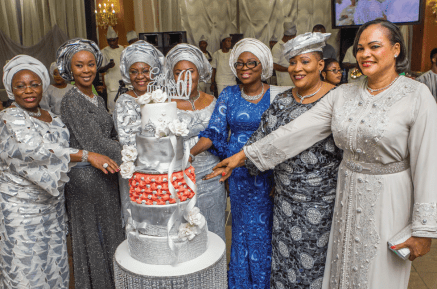 The celebrant who is one of the daughters of late Corporate Titan and Asoju Oba of Lagos, Chief Molade Okoya-Thomas pulled all the stops to ensure that the event held at the highbrow Oriental Hotel, Victoria Island, Lagos was classy, colourful and filled with fun. The member of the All Progressives Congress (APC) began the day in the vineyard of the Lord with a power-packed session of worship, praise and prayers. The Thanksgiving session was coordinated by two renowned men of God: Pastor Ituah Ighodalo of Trinity House and Pastor J. T. Kalejaiye of the Redeemed Christian Church of God. Little wonder that the celebrant and her guests described the experience as spiritually-stimulating. After the service, guests were ushered into another part of the venue where a first-class party complete with gourmet dishes, fine wine and good quality music had been prepared for guests. Now changed into a silver Iro and buba, the celebrant sparkled as she made her entry into the venue exchanging pleasantries with everyone as she made her way to the top table. The evening’s comperes were Comedians, Tunde Adewale (Tee A) and MC Abbey-and they were at their humorous best throughout. It was indeed a wonderful Diamond celebration for the former lawmaker who was described as a gem by some family and friends. During her 3-term stint in the House of Representatives, the celebrant who is interested in social development of women and children served as Chairman, Committee on Public Procurements as well as Prisons. She also served at various times as Member of Banking & Currency, Diaspora, Niger Delta and Women Committees.